I received some great news last weekend from Andy Finch... The latest person to join the ranks of hobbyists who have won show prizes with kohaku's bred by us. 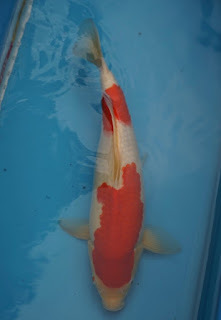 Andy purchased a few of our tosai this spring, grew them over the summer and entered these 3 into his club (Witham Valley Koi Club) Garden show this autumn. All entered into size 3. All 3 koi are from our 'Sharkey' spawning last year. The best placings were achieved by this 2 step. The picture is from the show, and suffers from ripples in the water line, but shows a strong looking fish which is pleasingly consistent from nose to tail. It came 1st in size 3 kohaku , and also 2nd in size 3 overall !! That's just a few places away from a potential young champion award. 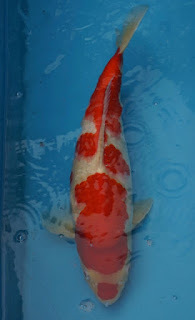 Andy also placed 3rd in size 3 kohaku with this 2 step kohaku. It's a great effort by Andy to grow the fish on, and have them in good enough condition to compete amongst some tough opposition to win those awards. We're chuffed he's done so well, and wonder how they might be looking next year. It's been some time since I gave you all a general update, and it's certainly overdue. And, here's a quick heads up on what to expect, in no particular order... . We've been looking at how we're going to expand our breeding programme next year. One of our additional 2 tanks is now mostly installed... just the insulation to go. it's currently going through a leak test this week. We're planning more selections this weekend. 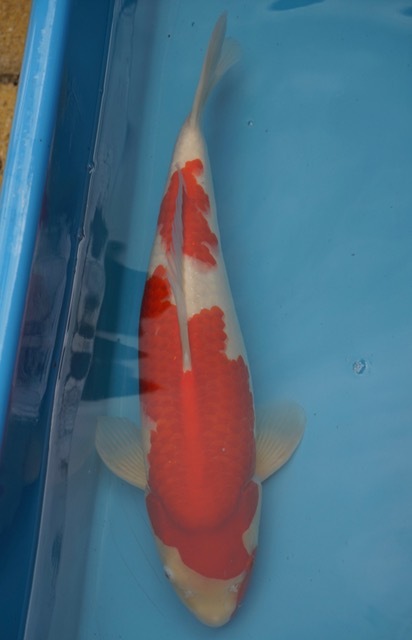 And, we've come up with some names for our other kohaku brood females. More on that lot in the next blog update.